A few months ago I had the privilege to review Lisa Dickenson's snort-out-loud funny novel You Had Me At Merlot for Novelicious and so I was super excited when the complete version of her previous book, The Twelve Dates of Christmas, which was released last year in six bite-sized ebook novellas, arrived in my mailbox just in time for my annual three-month-long festive celebrations. 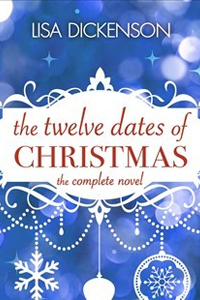 Twelve Dates does what it says on the tin, it chronicles main character Claudia's twelve dates during the month of December; ones which vary from the ludicrous (one of the men she goes out with has a nosebleed during the date. ON HER FACE!) to the utterly sweet. At the start of the novel Claudia sees her long-term boyfriend Seth's willy glaring up at her when all she wanted to do was take a quick wee during the interval of the ballet show she is watching and next thing she knows she finds herself single just before the holidays. Even though Claudia is still trying to process what exactly went wrong between her and Seth, her two best friends, Nick and Penny, refuse to let her mourn the loss of what according to their expert opinion wasn't meant to be a lifelong relationship and they organise a series of distractions for Claudia. With dates to places such as the ice rink at the Natural History Museum, the Royal Opera House for a performance of The Nutcracker and Winter Wonderland in Hyde Park, this novel sets the perfect seasonal scene for Christmas crazies such as me. Within the first few pages Lisa Dickenson had me cracking up again with her wonderfully witty writing style (this was also partly due to the mention of a glaring willy, which is certainly a memorable way to open a book). Lisa made her main character likeable and relatable so from the moment Claudia and Seth break up, the reader can't help but root for a much more suitable and swoon-worthy man to sweep Claudia off her feet. While the love story at the centre of the book was predictable this didn't detract from Claudia's hugely hilarious journey to finding her festive happily ever after. As Twelve Dates was initially released as six separate novellas, at the end of each two dates (one date equates a chapter) Lisa throws in some unexpected twists and drama to keep the reader hooked and eager to pick up the next part. I for one am glad that I had the chance to read the full novel though, rather than having to wait for the next instalment to be released, as this is a read perfectly devoured in one go (preferably accompanied by a freshly baked mince pie and a cup of hot chocolate, generously topped with whipped cream and mini marshmallows). Christmas may still be a little while off, but if you'd like to add some seasonal sparkle to the increasingly darkening days now then this funny read is the perfect festive pick-me-up! You can purchase the novel from Amazon.co.uk or your own preferred retailer. Edit October 2015, the novel is now out in paperback Get your copy from Waterstones, Amazon our your own favourite book shop!